I honestly have no idea what to call this, except to describe it. Sorry. :) This is a pretty simple tip, but it has made me very happy. I usually like to credit the people that I get ideas from, but I cannot find this one. 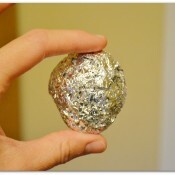 Originally, they used a note card and tape on cocoa powder. If/when I find the source, I will link it here. I tweaked it a bit, but either way could work great. I do not do well with things that are inefficient. For example, a ROUND cornstarch container with NO LEVELING DEVICE. Who designed that? Even Arm & Hammer managed to design a little cardboard leveler into the part that you pop open with their baking soda. With my cocoa containers, I can keep things close-ish to level because there are flat parts to the container, but not so with my ROUND corn starch container. 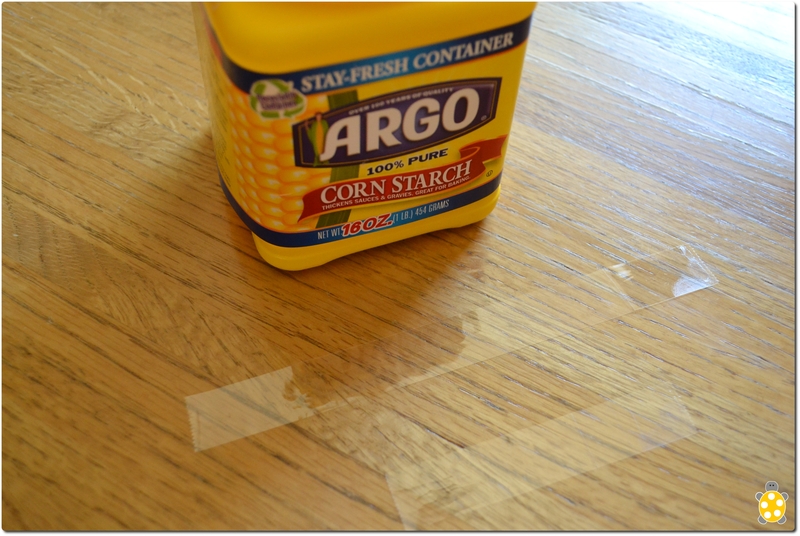 Usually my husband is the cornstarch user – and he only uses it when he makes gravies (he makes THE BEST), and the corn starch doesn’t seem to bother him. As I was using the corn starch for the watercolors, and also for a meatballs recipe that I will post later, it drove me crazy not to have something to level my tablespoons off with. So I remembered the tip I had seen and made my own little leveler out of scotch tape. 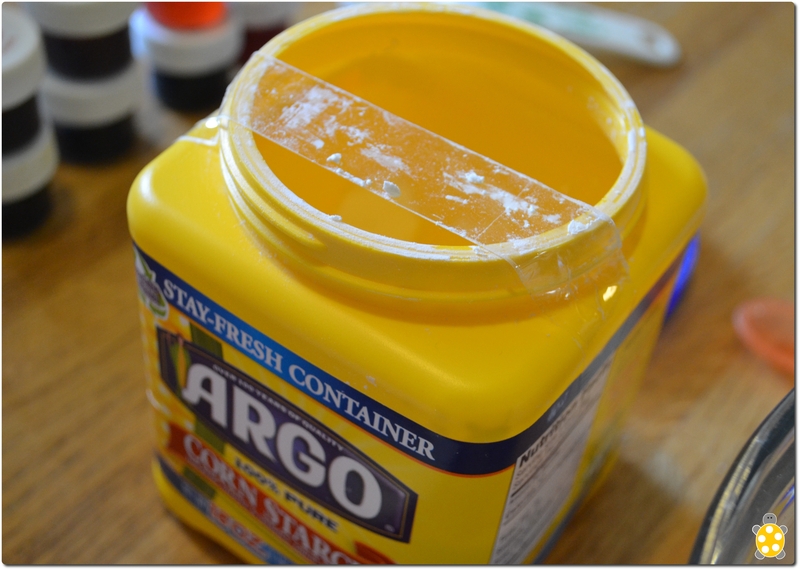 Take two pieces of Scotch tape – one slightly longer than the width of the lid (or opening) of the container you are adding your “leveler” to, and one that is an extra 3″ or so LONGER than the first piece. 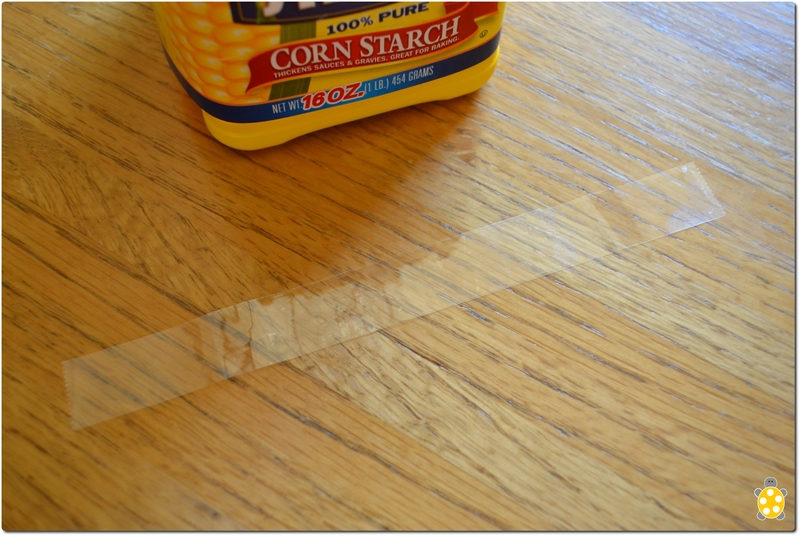 Lay them sticky side UP on your counter or table. Take the center of your shorter piece and line it up with the center of your longer piece. Then FLIP the smaller piece over on your larger piece. This will give you a non-sticky center (the part you will put over your opening), and extra length on the sides you can then use to attach your new “leveler” to your container. Voila! A cheap precision measurement instrument! 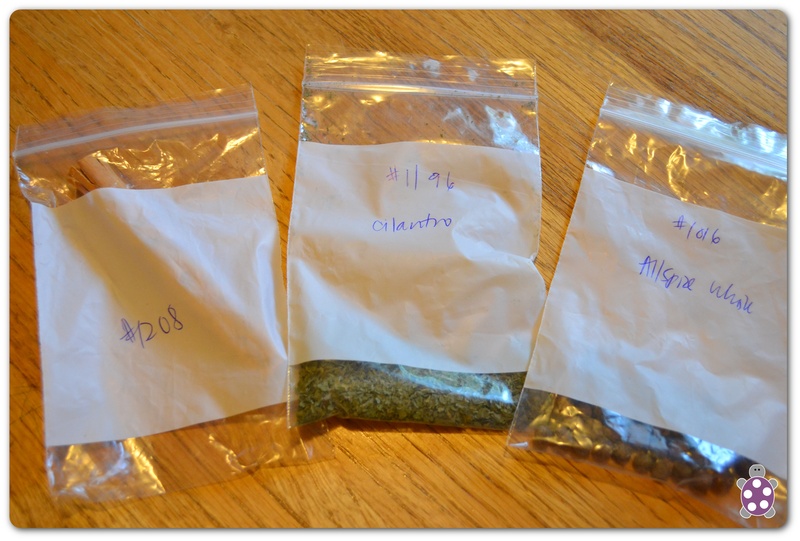 Until recently, one of the biggest deterrents to me in trying new recipes was the spice list. It’s great to try new things with new spices, but I have a VERY hard time paying $3 or $5 or $7 just for one jar of spices that I have never used before and don’t know if I’ll ever use again. And if there was more than one new spice – forget it! That was until I found the lovely bulk spices section of our local Sprouts store (this links you to the locations). I loved Sprouts anyway because of their great produce deals, but now I love them even more. I am guessing that if you checked around to other farmers market/whole foods stores in your area, they may have a similar bulk spices section. It is AWESOME. If we can find a bulk spices section here, I’m guessing you should be able to find them almost anywhere. When you get to your bulk spices section, do NOT be alarmed by the prices. 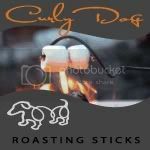 For example, cinnamon sticks here run $24/lb., but one large cinnamon stick only weighs .01 lbs. This means that it costs a whole $.24. Ha! From left to right in this picture: my cinnamon stick that cost $.24 (a bottle of small cinnamon sticks runs around $5 here); dried cilantro – it didn’t even weigh in on the scale so they gave it to me for free (even though I kept trying to get them to weigh some other spice so I could pay them SOMETHING); and my whole allspice – which also cost me around $.25. Fifty cents for three spices in the quantities that I needed is WAAAAAAY better than spending $10 for too much of those same spices. I also will go there to refill some of my more expensive spices when they run out. 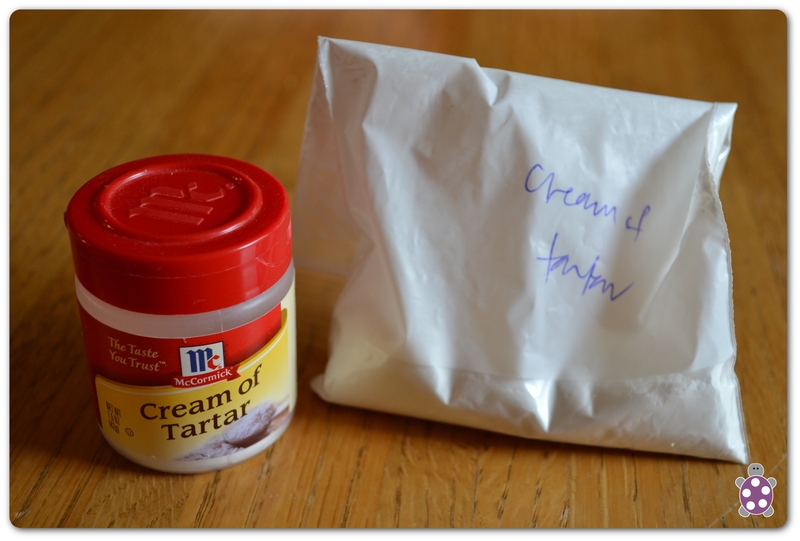 When I was trying to clean my cookie sheet, I ran out of Cream of Tartar. Remembering that they carry it at Sprouts, I decided to get a baggie of it to refill my empty container. To refill the jar to the point that I got it (I slightly underestimated) cost me $1.00. To refill it completely would have been about $1.33. To buy a new jar would have been $2.88. It is worth checking around to see if any of your local stores have a bulk spices section – both to expand your cooking horizons without breaking the bank, but also to refill your current spices on the cheap. I still will buy whatever $.50 generic spices that are available (onion flakes, cinnamon, etc. ), but for the spices that don’t have a cheaper option, this is a great alternative to paying full price. We are still debating as to whether or not we are actually going to use this, BUT I love the idea so I thought I would share it anyway. 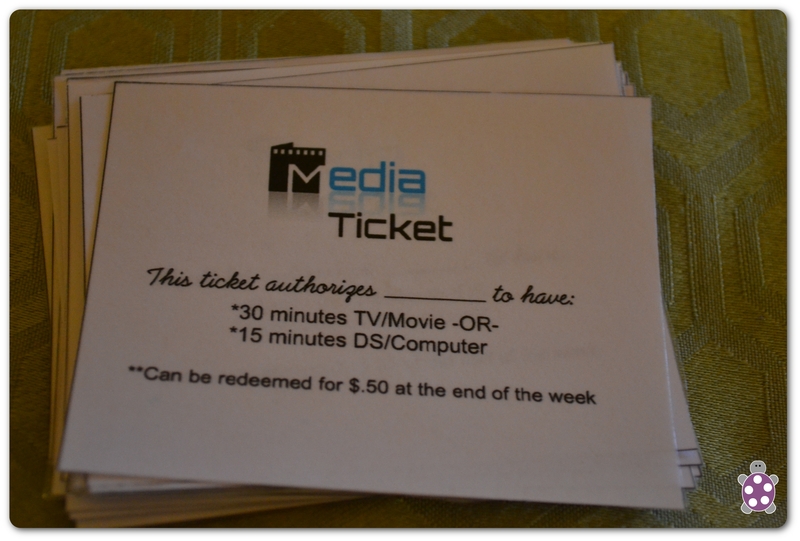 I had seen this idea for technology tickets from Laurel @ Ducks in a Row, and thought it might be a good way for there to be more of a balance between my kids learning how to use media appropriately and understanding a bit more about the value of time, (hopefully) without my being either too strict with media or allowing it to turn into a too-frequent babysitter. 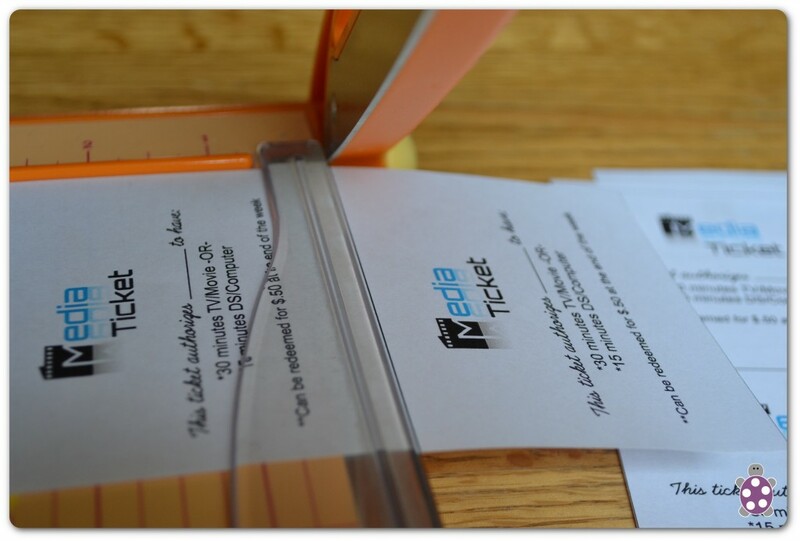 After I printed the cards off, I cut them and had them laminated at Mardel (this links you to their locations). 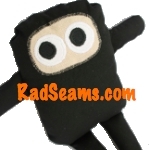 If you have one nearby and don’t know about their amazing lamanation prices – it is $.25/ft. of laminating. Steal of a deal. Like I said, we are still debating as to whether we will use these or not. 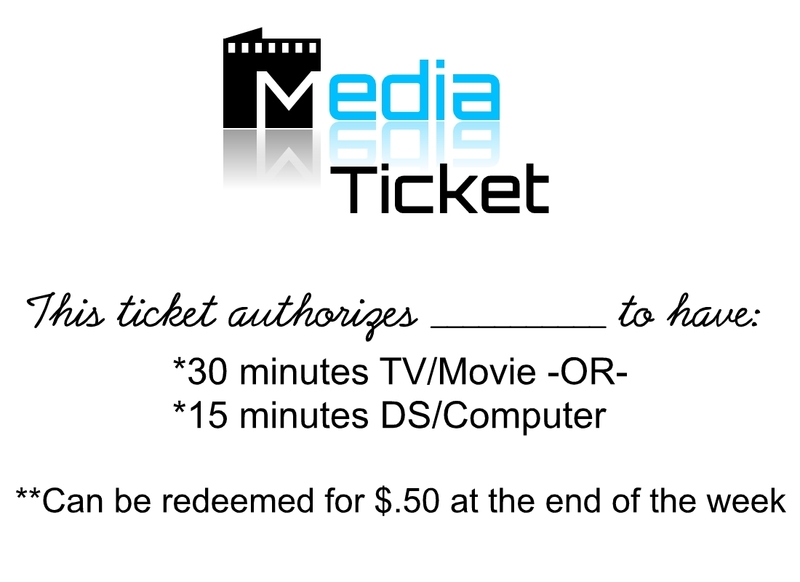 I’ll keep you posted on what we end up doing, and our system for doing it (Does each kid use a card to watch Wild Kratts, or does one of the kids pay for all three? If each has to pay individually, what do we do if one child runs out – banish them to another room? If only one pays, how do we make sure that our oldest doesn’t always convince the younger ones to pay so he can earn money at the end of the week? etc.). It seems like it has a lot of good potential – we’ll just have to use trial and error to see what works if we decide to use it. We also don’t want to incentivize them to bring more media into their lives now since they are pretty balanced kids who don’t have a ton of that going on right now. It’s a balance. Do you do something similar to this? How does it work for you? I love doctors. I am grateful for modern medicine. Sometimes modern medicine works great with a dose of natural help as well. This is one of those times – at least in our family. My oldest has had one ear infection in his life, and it was when he was three years old and we had no idea what was going on because he had never experienced it. He took antibiotics; it cleared up almost immediately; he was fine. My two younger kids have had different experiences. Both of them started to get ear infections starting around 9 months old whenever they got a runny nose, which maybe happened every month or two (thankfully not more often. My middle child stopped getting ear infections by the time he was 2 1/2 or 3, except for one random really bad one when he was four. My daughter is now 2 and some change, and has FINALLY stopped getting ear infections. But not because they have stopped, but because we found a solution that works better for us than the conventional antibiotic route. When my kids get ear infections, they are full-blown awful in both ears. That’s how we roll. Right before Christmas of this year, my daughter got a runny nose which turned into an ear infection. I took her into the doctor, but our normal pediatrician was off, so she was seen by a different doctor. My kids also routinely “fail” antibiotics, especially the ones that they tend to prescribe first, so I mentioned this to the doctor and she prescribed a stronger antibiotic to help hopefully get it kicked before Christmas. That was a blessing and a trial all at once. Turns out the antibiotic, first of all, didn’t help. At all. I bought an otoscope a while back (pictured above) from the store so I could check on my kids’ ear infections, or check on their ears if I was suspicious of something, and I could see that it was not budging. Second problem was that my daughter developed a very violent gag reflex to the medicine after about five days of taking the antibiotic. She got to the point where she would just throw up. In frustration, and thinking that there had to be a different way to take care of things other than shoving my kid full of medicine, I asked my friends on facebook for their feedback. I was surprised to see how many people help to prevent problems outside of trying antibiotics, and also glad to see that a lot of the answers were consistent. Armed with their input, and honestly a bit nervous because I am NOT a “natural remedies” person, I went to the health foods store and asked for some help. I found this lovely product (also pictured above), and it has been AMAZING. I gave my daughter a drop in each ear, and rubbed some from her ear down her neck to help get things moving – her complaining about pain went away almost immediately, she slept better, and I could literally watch her ear infection clear up (using my handy-dandy otoscope) over the course of a couple of days. It was awesome. I was still a bit skeptical, though. I wondered if maybe her ear infection cleared up because it was viral instead of bacterial and had run its natural course (which is why antibiotics may not clear things up). So I thought that we could put it to the test the next time something flared up. About a month later, she got another runny nose, and came up to me saying, “Ear hurt. Ear drops please.” I gave her a drop in each ear once each day for a couple of days (each day she would complain that her ear hurt), and it never developed into an ear infection. That was the first time in over a year that a runny nose did not develop into an ear infection. It was wonderful. The same thing happened again about a month later – same results. For us, this has been a great tip to know – it has saved us a ton of money on doctors bills and prescriptions, even in the last few months; it has kept my daughter from having to go through the pain of ear infections; it has helped us feel grateful as we have been able to sleep through the night because our poor daughter isn’t awake, screaming from ear pain. 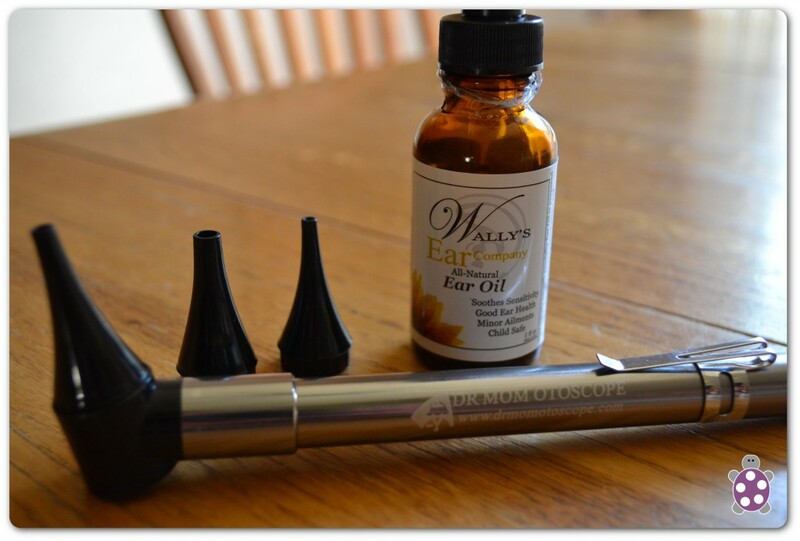 Wally’s Ear Oil contains Sweet Almond Oil, Eucaluptus Oil, Tea Tree Oil, Mullein Extract, Echinacea Oil and Garlic Oil. These different ingredients, alone or in combination, were what my friends recommended most. Those, or colloidal silver. (1) The product says to use on children 2 and over. My daughter fell into this category (she was a month shy of two when we first tried it), so I have no experience with trying to go outside of those guidelines. I would talk with your doctor about their feelings on using the drops on younger children. (2) The product also mentions NOT using it if the eardrum is ruptured. This is also where the otoscope could come in handy. (3) With the otoscope, if you should have one or purchase one, be VEEEEEERY careful when you are putting it into ears to keep a good distance from the eardrum. It gets easier with practice, so maybe try using it on our spouse or an adult friend or an older child, all of whom could presumably sit still for long enough for you to work slowly, before you try it on a younger child. It is not worth the risk of damaging their ears. 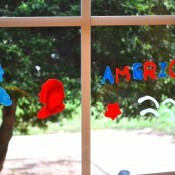 It is; however, very nice to be able to know what is going on. The one that I bought (Dr. Mom) is great, and comes with several pictures that show you what a “normal” ear looks like and an “infected” ear looks like. It is great to know when there is actually a problem with the ears, and when they are fine. It is a little expensive, but it quickly paid itself off. I hope this helps someone! Let me know about your ear infection tips too. 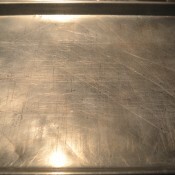 With the 800,000 ways to “get your cookie sheet GLEAMING NEW!! !” on Pinterest, I decided I needed to try it. And, yes, “THE” is singular. We were given probably seven cookie sheets when we were first married. 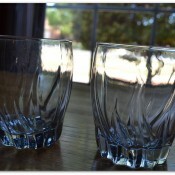 We gave several of them away to other people, left some at different places, and now have ended up with only two left. One of them I don’t like because it tends to burn things on the bottom, so really we only have one. 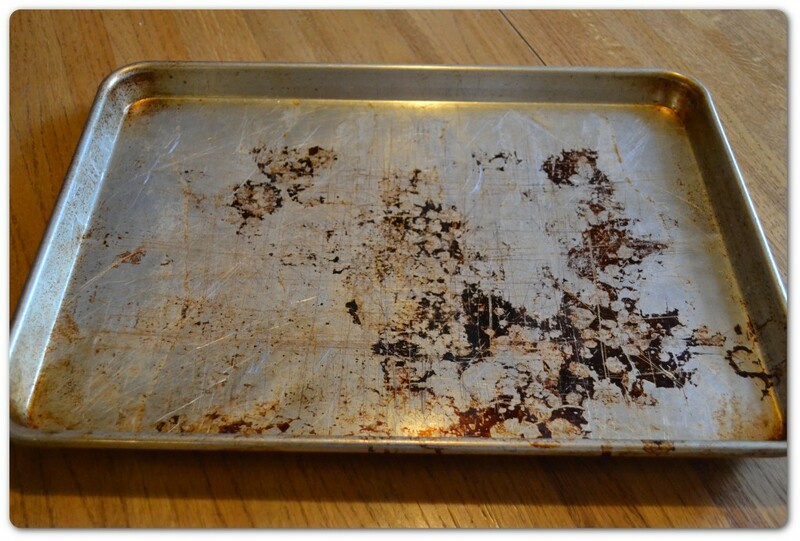 That one cookie sheet looked good for years. Until I ended up baking olive oil onto it at a very high temperature. And baking bacon in the oven without lining it first with parchment paper. Yeah. That all happened in the past year. We’ve had the cookie sheet for almost nine. 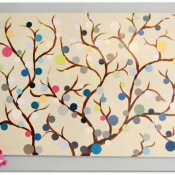 I found an idea on Pinterest that claimed to get your cookie sheets looking like new with no pain! Sounds great! But, it didn’t work. At all. This, unfortunately (fortunately?) led me on a maniacal quest to find a way to get the silly thing gleaming and new again. 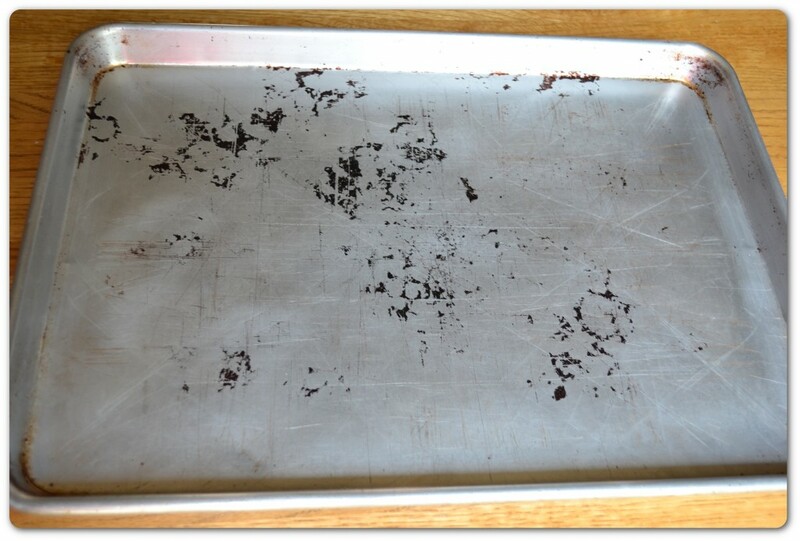 If someone is able to get a clean cookie sheet, certainly I could too! A big improvement. Not perfect, but it still surprises me when I see it out of the corner of my eye – it is so shiny! Minus the stubborn stains, it looks new. I just tell myself that the stains left on the cookie sheet are its battle scars and prove that it has lived to see many a hot oven and make many a good meal. And, gauging from the stains left and the hours I put into cleaning my faithful cookie sheet, I am the master of leaving stains that are practically impossible to get rid of. 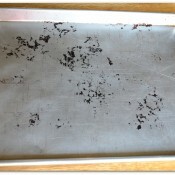 This is “The Cookie Sheet that Lived!” (think Harry Potter). 1. 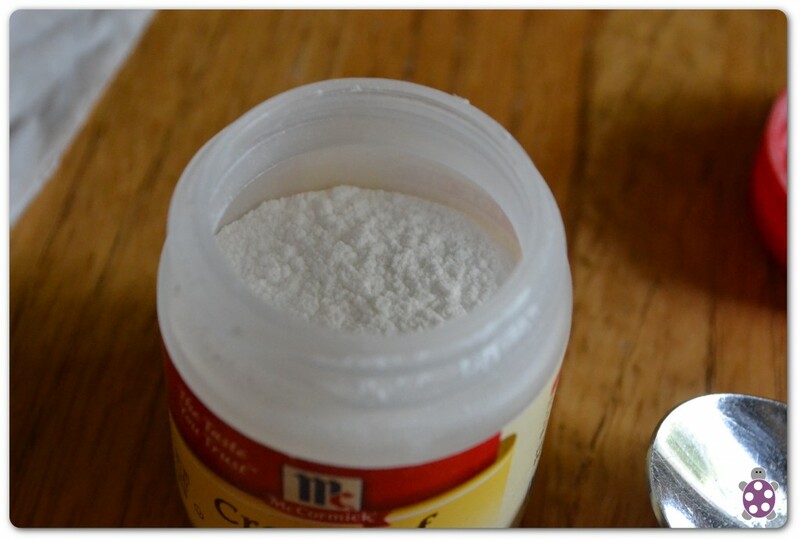 Baking Soda + Peroxide – this was the first thing that I tried. And one of the last things too. The author said that she just smeared it on with her hands. This did not work at all. I wish I hadn’t read the “hands only” part because that would have saved me hours of searching. BUT, it finally did work (hours later) when I came around and tried it again scrubbing with steel wool using all of my might. You could also just use baking soda, but I found that the two together really did work best – you just make a paste from them. Wear gloves too – it started turning my fingers white when I first tried the “hands only” method. 2. Bar Keeper’s Friend (from a comment string) – this was the first thing in the beginning that “budged” my stains with only using a sponge to scrub, but it didn’t do much to the big stains. HOWEVER, once I used Bar Keeper’s Friend AND steel wool, it got even more off than the baking soda + peroxide + steel wool. I just felt like I had to wash it 500 times afterward to make sure the chemicals were all gone. 3. Cream of Tartar + Vinegar – this left my cookie sheet GLEAMING, but otherwise the stubborn spots were still there. And Cream of Tartar is definitely more expensive than baking soda. 4. 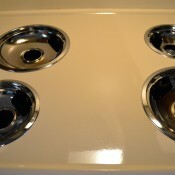 Oven Cleaner – this particular article mentioned leaving it on for 20 minutes. By the time I got around to trying this one, it did not to a lot for me. It seems like it should work in theory, but it didn’t work on the heavy stains. I also tried later to leave it on for 2 hours – DON’T. It left a funny residue on my pan. 5. Ginger Ale – It actually recommended cola soda, but ginger ale is what I had on hand. This one was interesting. After I poured it on and it had settled down a bit, I noticed that there were places where the carbonation was congregating – right around the big stains. I had hoped this would mean it would take them off, but it did not. It did, however, get the funny residue off that had been left by the oven cleaner. And it was quite shiny. 6. Sol-U-Mel – this is a fantastic cleaner, and was what the original pinned person said made their pans perfect and new again. It didn’t budge anything, but by the time I got around to trying the Sol-U-Mel, I may have gotten all of the easy stuff off. I tried full-strength even. No help there. 7. Magic Eraser (from a comment string) – this did not work AT ALL. 8. Goo Gone (from a comment string) – didn’t work either. 9. Washing Soda + Vinegar – this was my creation. I had thought that maybe since washing soda has a higher pH than baking soda, maybe it would be better at taking off the grime than baking soda alone was. Turns out that vinegar turns Washing Soda into a clumpy solid, and it is very hard to smear on the cookie sheet. When I did get it to smear on there, it turned grayish, but didn’t do much else. Same with Washing Soda and water. 11. Borax (reader comment) – this also did not work for me at all. There you have it. A rundown of pretty much everything I could find on the web. Let me know if you try or have tried any of these things – I’d love to hear how they work for you!